Includes: CD with software , Smart UPS signalling RS-232 cable , User Manual. – InfraStruXure Manager Compatible: Enables centralized management via the APC InfraStruXure Manager. – Automatic internal bypass: Supplies utility power to the connected loads in the event of a UPS power overload or fault. – Peace of mind that comes with full equipment compatibility and reliability of a leader: Provides pure sine wave output which is recommended by server manufacturers using active power factor corrected (PFC) power supplies. Safety agency tested and approved means that you can deploy Smart-UPS with confidence that they meet or exceed the industry’s most rigorous standards. – Avoids costly power problems by keeping your IT equipment and data protected and available. 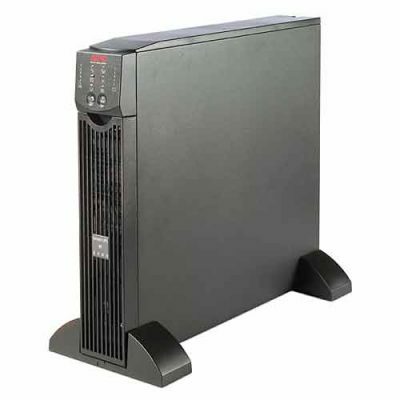 : Network grade power conditioning protects from damaging surges and disruptive noise. The double conversion architecture provides tight voltage regulation, frequency regulation ,and zero transfer time to battery during power events. – Save time with easy and convenient remote accessibility. : Network manageable via serial, USB or optional Ethernet. Includes Powerchute® Network Shutdown Software for convenient monitoring and control, safe operating system shutdown, and innovative energy management capabilities. – Low operating and maintenance costs with proven reliability and intelligent battery management. : Intelligent battery management, pioneered by APC, maximizes battery performance and life through intelligent, precision temperature compensated charging. Automatic self tests insure battery reliability and warn customers in advance of battery replacement. Convenient, easy to connect, hot-swappable battery modules provide battery replacement without powering down. – Input power factor correction: Minimizes installation costs by enabling the use of smaller generators and cabling. – Generator compatible: Ensures clean, uninterrupted power to protected equipment when generator power is used. – Frequency and voltage regulation: Gives higher application availability by correcting poor frequency and voltage conditions without using the battery. – Resettable circuit breaker: Easy recovery from overloads; no need to replace a fuse. – Predicitive failure notification: Provides early-warning fault analysis ensuring proactive component replacement. – Flash upgradeable firmware: Install maintenance releases of firmware remotely using FTP.